ANTI-AGING CREAM AT THE BAVE D'ESCARGOT. A COSMETIC REVOLUTION! Reduces wrinkles, fine lines and dark circles. Attenuates skin imperfections, slows down the aging process of the skin with a real anti-aging action. The virtues of the snail slime were discovered by a Chilean family, exploiting the breeding of snails for gastronomic purposes. By treating thousands of snails which must be cut up, workers injure their hands, nevertheless the cicatrization is realized very quickly. One of the sons in the course of medical studies, realizes this phenomenon and decides, around the 1980s, to have the snail slime analyzed by specialized laboratories and discovers the potential of its regenerating and healing composition. The properties of the snail slime, are a real treasure of nature, the snail has the ability to self-heal and self-regenerate thanks to its secretion. Our anti-aging cream with the snail drool acts in an extraordinary way on the skin contributing to the reduction of wrinkles, fine lines and dark circles. It alleviates skin imperfections, slows down the aging process of the skin with a real anti-aging action. Our snail drool cream intensely nourishes the skin. The concentrated extract of snail musus, (naturally rich in Allantoid) has regenerating, healing and soothing properties. Organic silicon acts on the restructuring of collagen, the main component of the epidermis. Due to the combination of these two highly effective active ingredients our cream effectively protects your skin from aging skin. No harm is done to animals (unlike animal husbandry for gastronomy), a product not tested on animals. Anti-aging cream with snail drool - active HYDRAPROTECTOL®. Immediate hydration immediately after the first hour of application and + 60% after 5 hours. 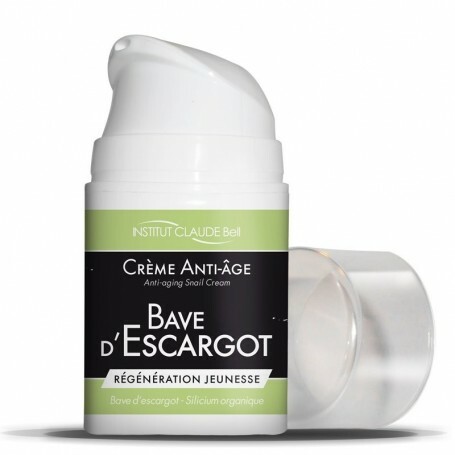 THE ANTI-AGING CREAM AT THE BAVE D'ESCARGOT WILL HELP YOU TO PRESERVE YOUTH FROM YOUR SKIN. Directions: To apply morning and evening, on a skin previously cleaned. Ingredients: AQUA, GLYCERIN, DICAPRYLYL Carbonate, GLYCERYL STEARATE, CAPRYLIC / CAPRIC TRIGLYCERIDES, methylsilanol Hydroxyproline ASPARTATE, BUTYROSPERMUM PARKII BUTTER, pentaerythrityl distearate, glycosaminoglycans, TOCOPHERYL Acetate, Sodium Polyacrylate, SODIUM STEAROYL GLUTAMATE, CITRIC ACID, SALICYLIC ACID, SODIUM CHLORIDE, PHENOXYETHANOL , SODIUM BENZOATE, POTASSIUM SORBATE, CHLORPHENESIN, PERFUME.